Typically, reverb plug-ins are either simple or versatile. FabFilter claim that their Pro-R combines both virtues. It’s more than a decade since FabFilter first grabbed the attention of the music-production world, through the innovative means of designing software filters that actually sounded good. Since then, the Amsterdam-based developers have forged an individual and very effective approach to user-interface design, and have been applying this to the core tools that mix engineers need every day. Rather than mimicking the look and feel of vintage hardware, FabFilter’s philosophy is to embrace the new possibilities that software design opens up. Everything is tailored for mouse control, with beautifully thought-out graphical displays that offer informative feedback. What’s particularly impressive about plug-ins such as the Pro-Q 2 equaliser, Pro-C 2 compressor and Pro-MB multiband processor is the balance they strike between ease of use and versatility. All sorts of features are implemented that wouldn’t be possible in the analogue domain, yet the control arrangements are intuitive and straightforward. The latest studio staple to undergo a FabFilter makeover is one where fresh thinking isn’t always as abundant as you might expect. Many of the reverb plug-ins I’ve come across lately are either based to some degree on old designs from the likes of Lexicon, or are convolution plug-ins, stocked with impulse responses based on old designs from the likes of Lexicon. In the design of reverb plug-ins, typically there’s also a fairly direct link between how flexible a reverb is and how many controls you have to figure out. No surprise, then, that neither of these is true of FabFilter’s Pro-R, which is available in all major native formats and authorised using a simple copy-and-paste key. Its design does not draw any obvious cues from reverbs of the past; and despite having only six main controls, it is capable of producing a remarkable variety of different sounds. This is partly because FabFilter have found ways to make one or two controls do the work of many. Take, for example, the Character parameter, which runs from ‘Clean’ at one end of its travel to ‘Chorus’ at the other extreme, with the mid-point labelled ‘Lively’. This naming scheme suggests, rightly, that high Character values introduce more pronounced modulation into the reverb, but there’s a whole lot more going on, too. At the Clean end, the reverb is dense and smooth, with early reflections not obviously differentiated from the tail. In the Lively region, there’s not only more motion in the tail, but the early reflections become more distinct; while going further still can push things into obviously synthetic territory. Thus, a single control covers not only modulation, but also a lot of what would normally be done by parameters such as diffusion and early reflection scatter. The Distance knob is another case in point. Rather than provide a separate early reflections section with its own set of controls, FabFilter have come up with a single parameter that simultaneously adjusts both the balance of early reflections against reverb decay, and the character of those early reflections, in a perfectly intuitive way. Nor is there any tedious switching between algorithms, or adjusting the dimensions of virtual halls. Instead, a single large Space dial moves seamlessly though 12 room models of different sizes, from bathrooms and claustrophobic ambiences at one end of the scale to cathedrals at the other. This is augmented by a Decay Rate control, which provides global adjustment to the reverb time without otherwise changing the shape of the virtual space, and a Brightness knob, which simulates greater or lesser amounts of high-frequency absorption. Beautifully simple, yet highly effective — and I haven’t even got to the best bit yet! The five controls I’ve already described represent a pretty versatile reverb on their own, but the icing on the cake is supplied — along with the marzipan, candles and ribbon — by the Decay Rate EQ. By now, I imagine most of us are familiar with the idea of using EQ to fine-tune a reverb preset, either on the input or output side; and most reverb plug-ins come with at least basic tone controls. Indeed, Pro-R includes a conventional six-band output equaliser. This is displayed as a yellow curve and behaves very much like FabFilter’s excellent Pro-Q 2 equaliser: everything is editable by clicking and dragging, and bands can take on all the usual shapes including notches. The Decay Rate EQ looks the same, except that it’s blue, and is edited in the same way, but what it does is quite different. One of the key features of real spaces (and of mechanical reverb systems such as springs and plates) is that the duration of reverberation is very frequency-dependent. Different structural materials such as brick, stone, wood and glass all tend to absorb more effectively in some areas of the frequency spectrum than others. Adding soft furnishings to a space increases the absorption of high frequencies but has little effect on low-mids. Conversely, introducing a tuned absorber such as a Helmholtz resonator into a space will reduce the decay time within a narrow band around a specific low frequency. The aforementioned Brightness control provides a broad-stroke way of tailoring the reverb to reflect these considerations, but the Decay Rate EQ lets you do so in much, much more detail. As with the conventional EQ, it provides six bands, each of which can either be a bell curve, notch, shelf or filter. However, applying ‘boost’ or ‘attenuation’ in a particular frequency region does not directly make that region louder or quieter. Rather, it increases or decreases the decay time in that particular region. The genius of this idea is that, even though the ability to shape decay time in this way is quite novel, the EQ-like interface makes it feel immediately familiar and intuitive. Although you’re not actually EQ’ing as such, it very often turns out that the moves you want to make with the Decay Rate EQ mentally translate into EQ settings. So, for instance, if a preset is sounding a little muddy on your source, gently ‘dipping’ the decay time in the low mid-range can add clarity; or you can help a source sparkle by boosting somewhere in the upper mids. Some of the presets nicely illustrate the way in which strategic application of the Decay Rate EQ through the mid-range can suggest the character of different wall materials. The Decay Rate EQ goes a lot further than this, though, enabling you to do things that simply wouldn’t be possible in most reverbs. For instance, a narrow boost at the resonant frequency of a drum can add power and weight to its sound without increasing the overall ‘wetness’ of the reverb too much; or you could notch out sibilant frequencies in a vocal reverb. You could even automate its settings to reflect key changes and so forth. The proof of the pudding is, they say, in the eating; so how does Pro-R taste? Well, as I’ve already mentioned, one of its main strengths is its versatility, so it would be wrong to expect a single very definite character to come through all the time. In general, though, I think it’s fair to say that this is a product dedicated to producing musically useful sounds, rather than convincing recreations of real spaces. It doesn’t typically have the ‘you are there’ quality that you can get from something like the Flux IRCAM Tools Verb plug-in; nor would it be an obvious choice for grotty springs, clangy plates or gritty lo-fi vintage digital. Inasmuch as it has a character, that character could best be described using terms such as smooth, rich, sophisticated and classy. In fact, although it doesn’t sound especially Lexicon-esque, I’d say Pro-R has the same strengths as some of the high-end Lexicon reverbs: given a source sound and a mix into which it needs to be bedded, it makes the process of finding a setting that works effortless. It’s as adept at cathedrals and churches as it is at small spaces, and most of all, enables you to get good sounds quickly. The clever design means not only that a handful of controls open up endless sonic possibilities, but that it’s also very hard to make Pro-R sound bad. This is especially true of the Decay Rate EQ, where even curves that look terrifying often yield highly usable results. Also, I can’t end this review without mentioning a few other neat features. Pre-delay can be set in milliseconds or sync’ed to host tempo, and there’s a continuously variable stereo width control. What’s more, unlike many plug-in reverbs, stereo patches tend to hold up pretty well when a mix is auditioned in mono. Oh, and of course Pro-R doesn’t just sound good: it also looks great, with a neat animated display that shows the reverb decaying in real time. Criticisms I have are few, though there were moments when I found myself thinking ‘Wouldn’t it be nice if...’; for instance, so powerful is the Decay Rate EQ that it would perhaps be useful to be able to save presets for it independently of the main preset menu. One can also imagine the Distance parameter developed to effect more precise placement within the virtual space, while a comb filter option in the Decay Rate EQ would have a lot of potential for ‘special effect’ reverb. 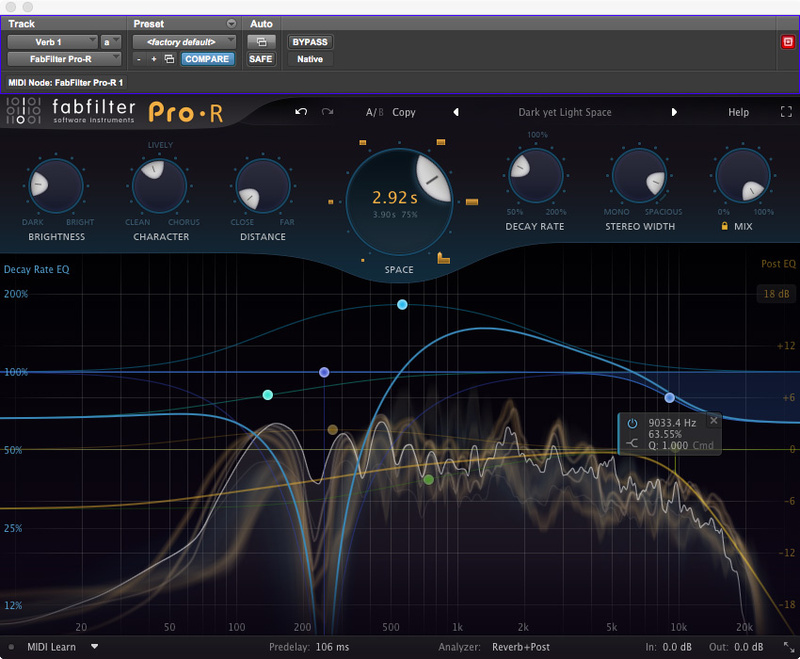 All in all, though, Pro-R is yet another demonstration of the worth of FabFilter’s distinctive vision for plug-in design. It’s as simple to use as the most basic reverb you’ll find given away with virtual cornflake packets, yet has a sound and a range that plug-ins with tens or hundreds of editable parameters struggle to match. Beautifully thought-out user interface offers great versatility from relatively few controls. Capable of producing a wide range of great-sounding reverbs that work in a mix. If you’re looking for exact recreations of vintage plates, springs or lo-fi digital verbs, this probably isn’t the plug-in for you. FabFilter have re-thought the way we interact with reverb plug-ins, and Pro-R makes it easier than ever to sculpt the ambience that’s right for your mix.